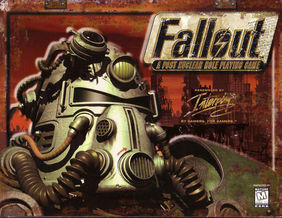 Fallout, a series of role-playing games created by Interplay Entertainment, dates from 1997. The games are set in a post-apocalyptic, alternate-history United States, during the 22nd and 23rd centuries. Even though the series is set in the distant future, Fallout’s snarky humor and atompunk, retrofuturist aesthetic draws heavily upon post-World War II America—in particular its cheery promises of better living through technology marred by a persistent Cold War threat of nuclear annihilation. In Fallout’s alternate history, the universe is locked in a 1950s cultural stasis by setting up vacuum tubes and atomic physics as the foundations of scientific progress while transistors cease to exist. The games’ world has sophisticated robots and nuclear-powered cars coexisting alongside antiquated computers and telephones. The stage for gameplay is set by the depletion of petrol reserves, then the Resource Wars between Europe and the Middle East. The UN is dissolved. The US annexes Canada. China occupies Alaska. All these conflicts culminate in a “Great War” in 2077 and the post-apocalyptic aftermath that becomes Fallout’s environment. Wasteland (1988) is considered to be Fallout’s spiritual predecessor. There are five main entries into the series and three spin-offs.